"The Gospel", What is it? For centuries the term "the gospel" has been thrown around. What does the word gospel even mean? This one article will not suffice but should rather start one on the path of thinking about the gospel. The word gospel means "good news". Whatever the gospel message is it is one of good news. Most messages preached in the average church are not messages of good news at all. The most popular gospel is a false one and the word of God warns us in many places to beware of it and those who preach it. The true gospel is the good news of the Person and work of the Lord Jesus Christ. In other words, it is concerning who Christ is and what He did to save sinners. The gospel includes the how and why, which can only be seen by faith. It is a message that declares how the eternal Son of God came down, took on a body of sinless flesh (John 1:14) as He was born of a virgin (Mat 1:23). He was both God and man in one Person. He was born under the Law to keep and fulfill it (Mat 5:18, Gal 4:4). He did that, not for Himself, but for all those He represented because they could not keep it themselves. The word of God calls these people the elect or His sheep, among several other names. His obedient life also included the part of dying. He took on the sin of His people as both a Substitute and Representative of those people. The Bible said He was "made to be sin" (II Cor 5:21) and the way that was done is by God imputing (legally reckoned or charged to the account of) sin to Christ. That means all the sin of all those people God chose was "laid on Him" (Isaiah 53:6). This sin was legally transferred to His account and He then owned it in such a way to be guilty of it all. God the Father poured out His wrath and hatred toward sin on His Son and had pleasure (Isaiah 53:10) in doing so, in that, He was completely satisfied in Christ as a Sacrifice that met all the demands of His strict Law and inflexible justice. 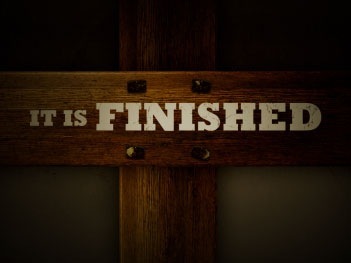 Christ finished the work of paying the penalty of the Law and then said " It is finished" (John 19:30). He secured salvation for all Gods chosen people that would even be born. His resurrection is evidence of the acceptance of His sacrifice to the Father. The combined work of His obedience to the Law and His obedience unto death on the cross was considered establishing righteousness. This is what one of the Old Testament prophets prophesied as "bringing in an everlasting righteousness" (Daniel 9:24) as Christ died effectually and exclusively for those chosen of God before the world began (Eph 1:4). This righteousness is what God imputes to His people in the context of giving the life to believe in Christ. This puts them in a state called "Justification" and as a result they are eternally secure, in Christ. This is the gospel (Rom 1:16-17). All this takes place in such a way to show God as both a God of justice and a Savior. This is how grace reigns through righteousness (Rom 5:21).